This Manual Will Empower Your Leadership! Soft skills, "holistic development", "employee empowerment"
through whom energy propels the group. knowledge, we can see evidence of its effects. self-actualization and abilities even further. Bill Thomas is publisher of leadership skills training materials. courses & programs. "Your Leadership-UltraNet!" is the Web's only ULTRA-Performance Empowerment System That Shows You How-To Think-like, Act-like, Behave-like, Believe-like and then Manage-like a Creative, Confident, Persuasive, Highly Effective Leader, Each & Every Day! 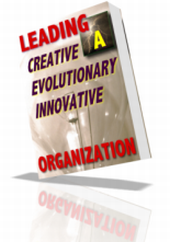 "Leading A Creative, Evolutionary, Innovative Organization!.